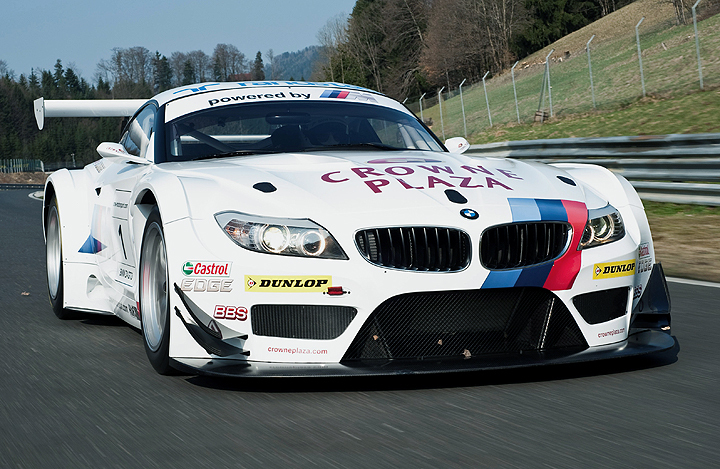 The BMW Z4 GT3 will be representing the BMW Motorsport colors at this year’s 24 Hours Nurburgring. Expectations will, of course, be very high for the fortieth anniversary of BMW Motorsport. This year too, the Schubert BMW team will be taking their places on the Nürburgring with the BMW Z4 GT3. Owing to their DTM commitment, the Schnitzer BMW team will be unable to pilot the BMW M3 GT at this year’s 24 Hours. The Schubert team have therefore set themselves the target of overall victory with the BMW Z4 GT3. And BMW Motorsport will be giving them all the support they need for this target. All of them experienced BMW Plant racers, BMW Driving Experience Chief Instructor Claudia Hürtgen, Dirk Adorf, Uwe Alzen, Dirk Müller, Jörg Müller, Nico Bastian, and Dominik Schwager will be piloting the two BMW Z4 GT3 models in the BMW Motorsport colours. The Schubert BMW team already won its first victory in 2012 at the last VLN race on the Nürburgring – so the high expectations seem to be justified. For the 2012 season, also the Vita4One team headed by Michael Bartels have decided to pilot the BMW Z4 GT3 at both the FIA GT1 World Championship and the 24 Hours Nürburgring. Having passed its initial test drives after its official presentation in early March 2010, the BMW Z4 GT3 is now enjoying great popularity among BMW Motorsport customers. 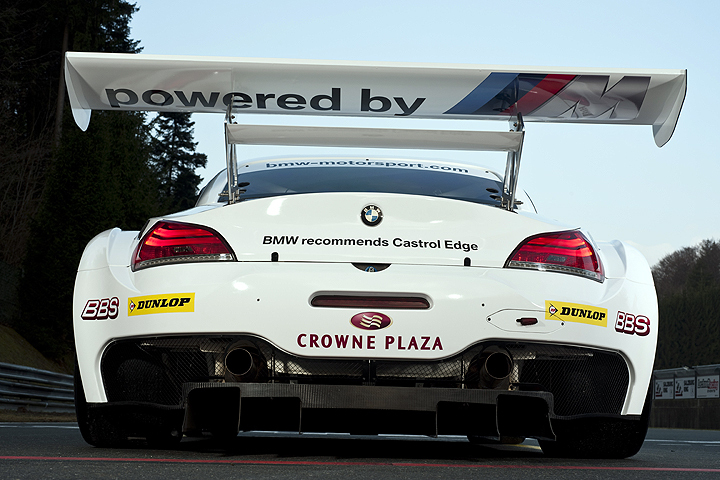 The BMW Z4 GT3 will be used in championship races according to GT3 rules (e.g. the FIA GT3/GT1 European Championship, the International GT Open, and the ADAC GT Masters) and in 24 hour races. Also the series BMW Z4 model knows how to impress: With its elongated bonnet, large wheel cutouts, long wheelbase, and short overhangs, this sports car presents an unmistakable look. The two seater provided a good basis for the BMW Motorsport engineers to derive a GT3 racing car close to series production. The greatest difference between the series and racing vehicle can be found inside: Whereas the series BMW Z4 vehicle is powered by an inline six cylinder engine, the drive behind the racing version is now provided by eight cylinders with a total displacement of 4.4 litres. This power core delivers over 500 hp. Owing to its excellent performance characteristics and good torque curves, the basic engine that is also used in the special BMW G3 GTS model is the perfect choice for racing. As regards electronics, the private teams can look forward to innovative solutions from BMW that have already become established features in the BMW M3 GT: Engine control has been allotted to the modern ECU408, and the Power400 controller is responsible for all actuators. Engine power is transferred over a sequential six speed gearbox featuring “Quick Shift”. The rims are fitted with central locking and safety clip. The BMW Z4 GT3 also provides assist systems like racing ABS and traction control that have been adopted from the other vehicles in our customer sports range and refined and modified for use in GT3 racing cars. The front axle of the BMW Z4 GT3 is an all new design that is based on a series concept. This is fitted with a tubular stabiliser with adjusting blades. Like on the series version of the BMW Z4, the rear axle is designed as a trailing link suspension. The sheet steel body of the racing car is manufactured at the BMW Plant in Regensburg and features a welded-in safety cell of high strength precision steel tubing. The M8 engine block and the propeller shaft are manufactured in the BMW alloy foundry in Landshut. The front and rear aprons, the bonnet, roof, wings, and many other components are made of carbon fibre reinforced plastic (CRP). This lightweight, torsionally rigid material helped to reduce the weight of the BMW Z4 GT3 to the race compatible 1200 kilograms. In 2011/2012, many parts of the Z4 GT3 were revised. The object of these modifications was to enhance above all the aerodynamic efficiency. In the end, the Z4 GT3 received a revised aerodynamic kit, a modified exhaust, a new rear axle differential, a new rear wing geometry, and a larger fuel tank. Now that the pilot’s seat is fixed in the Z4 GT3, the pedal box presents a sliding design that can be adjusted quickly to a range of body sizes. 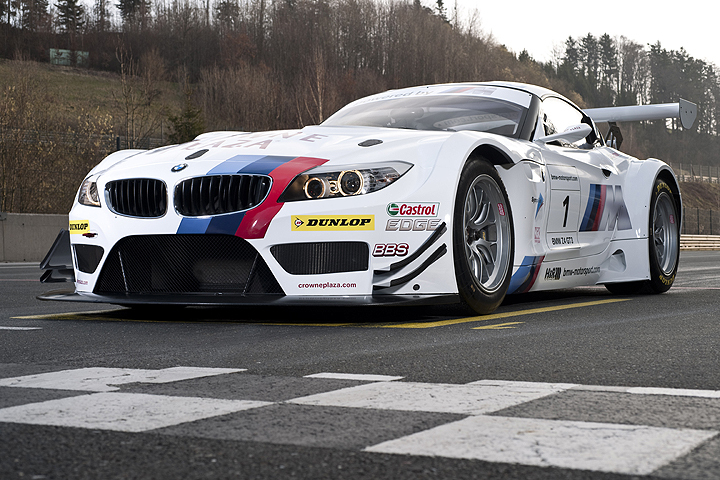 The present plan is to continue developing the Z4 GT3 until 2015 at the earliest. 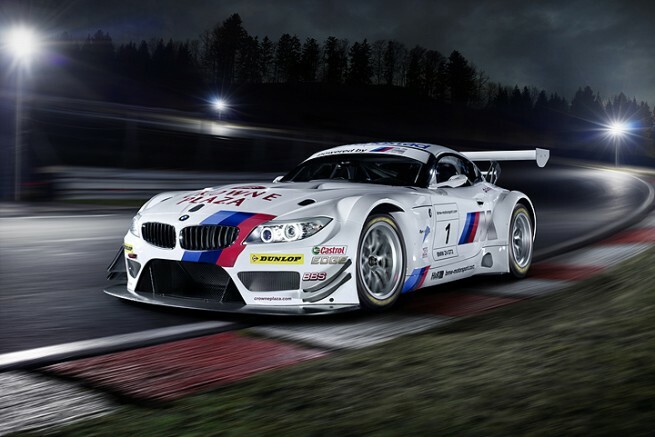 Specifications – BMW Z4 GT3. Engine control: BMW Motorsport ECU408 with two powerful CPUs; cylinder selective injection; pit speed limiter function, Quick Shift; EML; integrated traction control; VANOS controller; electronic onboard power supply monitor.